Red Crystals are a stone of health offering energetic healing support and may be helpful during prolonged illness or hospitalization. Amazing, intense waxy natural Red Calcite from Mexico. Terra Cotta colored smaller sized Red Jasper Tumbled Stones. 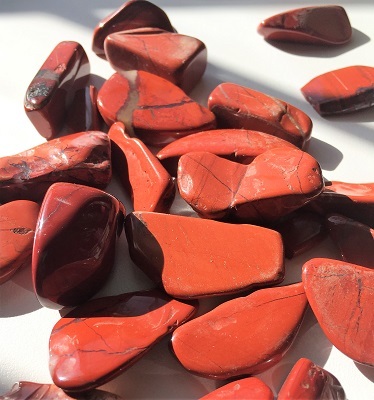 These red jasper tumbled stones are the perfect size for medicine bags, smaller crystal grids, crystal intention gardens, or orgone generators. Cool looking Red Jasper Skull Carving with drilled side holes so you have the choice to also wear as a bead/totem. Frosty white with shades of red colored natural Orange River Quartz Crystal Points from the Orange River area located in South Africa. Stunning extra large dark mahogany red, tan, yellow, gray, purple-pink, and ivory white Mookaite Jasper Rough mineral specimen from Mooka Creek Carnarvon in Western Australia. Gorgeous dark red faceted Garnet Crystal from India. Brick red colored Red Jasper Chip Crystal Bead Bracelet strung on 6 inch elastic cord. Multi-colored crystal chip bracelet of mahogany red, tan, yellow, gray, purple-pink, and ivory white Mookaite Jasper beads on a 6 inch elastic cord from Australia. Beautiful rusty colored Hematite Quartz Crystal from the Orange River, near Riemvasmaak, in the Northern Cape of South Africa. Beautiful chocolate-cherry colored natural Hyacinth Zircon rough crystals from Malawi, Africa. Beautiful Angel Amphibole Phantom Quartz Crystal tumbled stones with creamy white, tan, fiery orange-red, and soft grey colored inner wisps of swirling minerals from Brazil. Beautiful Polychrome Jasper free form tumbled stones from Madagascar, Africa. Beautiful burgundy colored Red Tiger's Eye tumbled stones. Natural Dragon blood stone is a unique Bastite Amygdale mineral composed of Green Epidote and Red Piedmontite from the Limpopo province of South Africa.